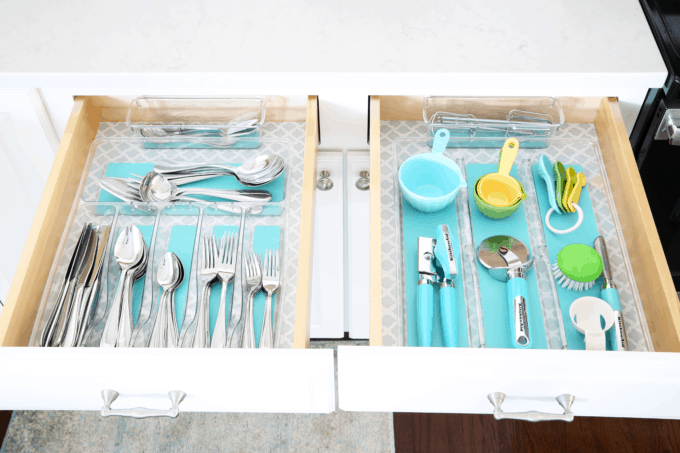 I’ve collected the top 10 best organizing items from Target– keep an eye out for these helpful organization tools during your next Target run! Hi, I’m Abby and I really like organizing supplies. Well, I really like organizing in general, so of course it would only make sense that I like the supplies as well, right? A few months ago I did a post called “Top 10 Best Organizing Items from IKEA,” and since then I’ve gotten request after request to share my favorites from other stores as well. Unlike IKEA, all of Target’s items are not exclusive to their store, so some of the items on my list could certainly be purchased at other retailers as well. Like my IKEA list, though, I stuck to things that I personally own and use often so I could vouch for each of these organizing items from personal experience. 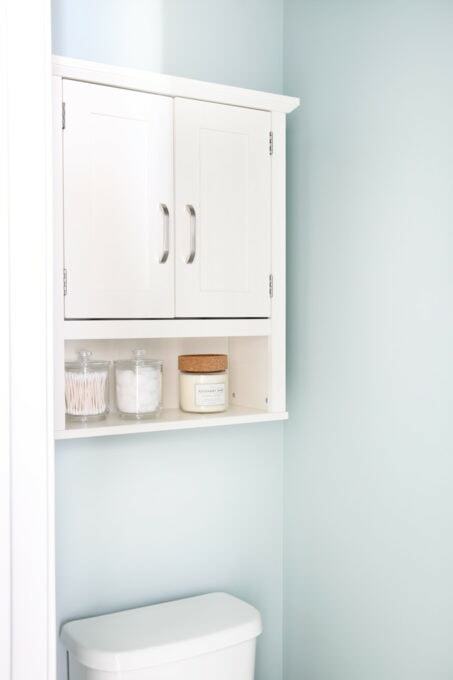 This cute little cabinet is a recent addition to our master bathroom water closet. I love it because it makes great use of the vertical space, and since we use it to hold toilet paper, it frees up some space in our vanity that we were previously using for that purpose. I have used this method to store my necklaces for just about my entire adult life. I use a simple bar meant to hold towels in the bathroom and some s-hooks originally created to hold a shower curtain, and my necklaces are easily sorted and don’t get tangled. I am currently using these containers under our kitchen sink, and I LOVE them. They are a bit pricey, so I add to my collection little by little, but the quality is great. They’re easy to open, and completely air tight. Target also has their own Room Essentials brand of food storage containers, though when I checked them out at the store, the seal didn’t seem completely air tight, but they would be great for storing items other than food and would be more affordable. No matter which cube unit I’m using, Target is the first place I look for fabric storage bins. They have a huge selection, and the colors and patterns they have are cute and on trend. I used fabric bins from Target in my office in our last house, and we currently have them organizing toys in the boys’ playroom. These cute silverware trays are Target’s Room Essentials brand, so they’re very inexpensive, and I really, really like them. I’m always a fan of acrylic, and then the rubber inserts keep things in place so they don’t slide around much when you’re opening and closing the drawers. I got mine a few years ago, so they have the aqua inserts. At the time of this writing, I believe the ones they’re carrying in the store have gray inserts, which would match a bunch of different kitchen color schemes, and it would be fun to add a pop of color by putting a pretty drawer liner underneath them. I have to give a shoutout to the entire decorative basket section because they always have a wide selection of baskets in all sizes that are perfect for adding texture and interest to a room as well as keeping things organized. I currently have their Threshold brand wicker baskets in my kitchen, my office, and our closet (and we have wire bins in our closet as well, which hold sheets and some of Donnie’s extra items). 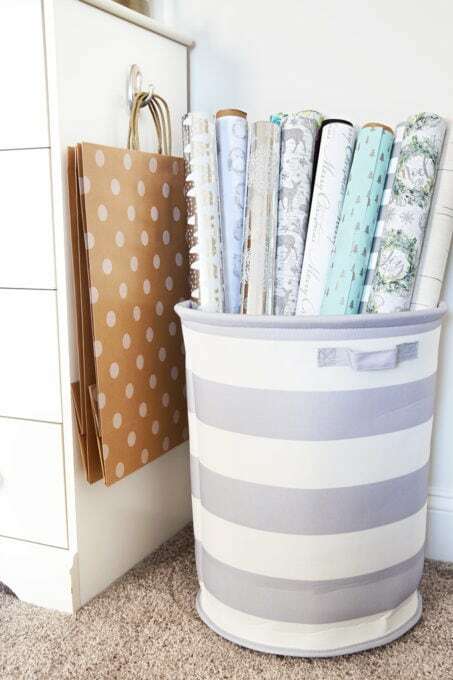 I love these tall round striped bins from the Target’s Pillowfort brand! We have two and have used them for a bunch of different things. They’ve stored stuffed animals and Nerf guns in the boys’ playroom. I’ve used one to store gift wrap. And I currently use one as a hamper for dirty clothes in the boys’ bedroom as well. These modular drawer organizers (and these!) 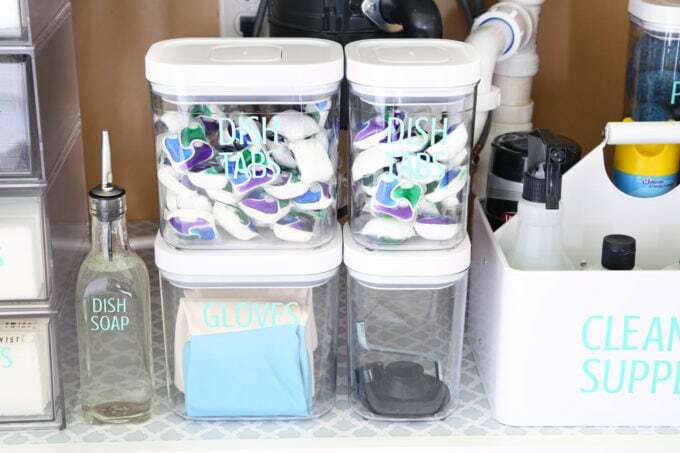 are some of my favorites because you can mix and match them and use them in different configurations depending on the size and shape of your drawer. At my Target they are near the bath decor section, and they are InterDesign brand. Right now I’m using some in the big desk drawer in my office, and they keep our kitchen “junk drawers” organized as well. I have declared my love for Target’s y-weave baskets over and over again because they really are so versatile, come in several different sizes and colors, and hold up incredibly well. We currently use one in the playroom to hold the boys’ Bionicle pieces, and we have them all over our kitchen, both in the pantry and in the cabinets as well. 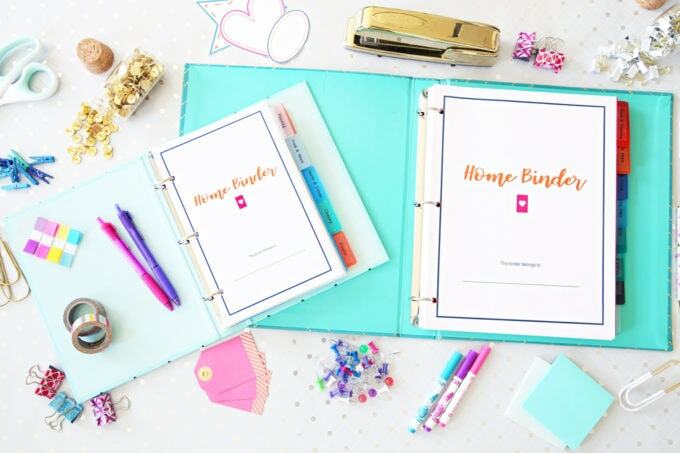 You might be surprised at my #1– 3 ring binders! I gave binders the top spot simply because it is SO HARD to find really cute binders anywhere, and Target consistently has a great selection. Their regular school supply aisles are great, and I’ve also found a bunch of cute mini binders in the Dollar Spot as well. (Many of them are only in stores, but I do love this one and this one that you can buy online!) Many of the photos of printables for the blog are taken using Target’s cute binders as a backdrop! 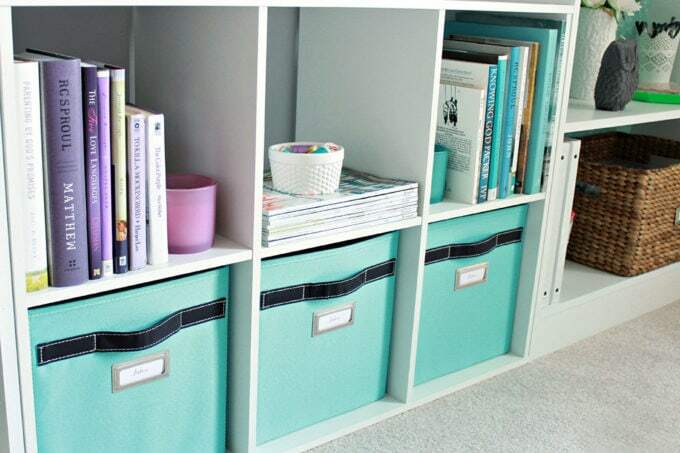 So those are my 10, but I know for sure there are other amazing organizing items from Target that didn’t make my list! Be sure to let me know in the comments below what other organizers I need to check out the next time I’m at the store! I hope they never stop selling y-weave baskets. I use them all over the house and keep coming up with more places to use them. I love that they have different colors but I stick with white, which they always have. That way they all match and I can easily move them around to different rooms. 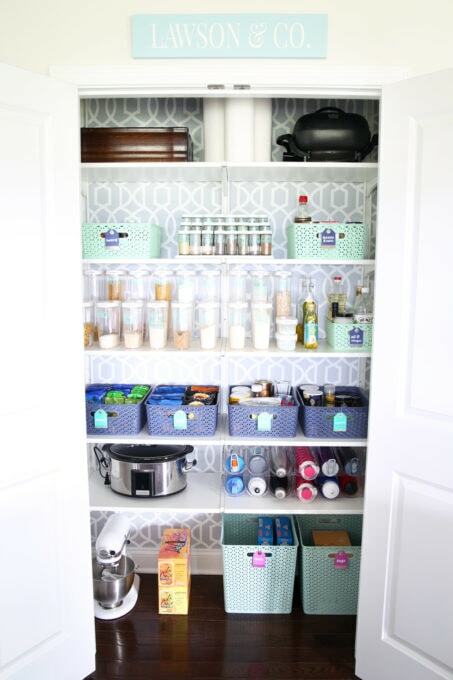 Love the OXO containers too – I use them in my pantry for food storage. They stack neatly and are easy for the kids to open and close. Great roundup, Abby! Agreed! They are so useful and hold up really well! Smart move with always snagging the white! Hope you’re having a great week, friend! I love your idea with the S hooks! I’m gonna have to try that! So simple, but so handy! 🙂 Hope you’re having a great week, Ellen! Great ideas! I am not fortunate enough to have a big clothes closet. Do you have any suggestions for storing small handbags? Hi, Kimberly! I stack mine flat in a small basket in our closet. 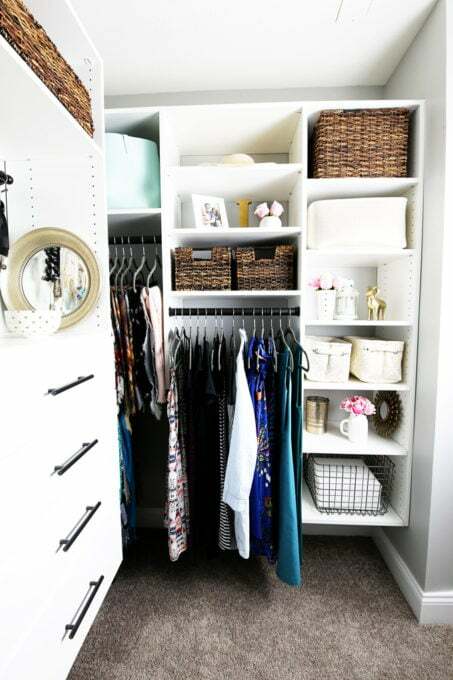 They also make back-of-the-door organizers for handbags (https://www.bedbathandbeyond.com/store/product/over-the-door-purse-racks-in-white-set-of-2/1061258471?Keyword=handbag%20organizer), which is a great use of space if you’re working with a small area! I hope this helps! Target is one of the stores where my husband holds my purse because I know I’ll spend money there. One of my favorite things to do is look on the end caps for clearance items that compliment or match what I’m currently using. I also keep track of sales and deals via their Cartwheel app. This has saved a ton of money (as long as you’re willing to play the waiting game). Have a great day, friend. I have the very same set of wicker baskets from Target and love them. I use them in my bathroom. They are stacked on their edges and used to store rolled towels. Thanks for the list. I have to watch for some of the others on my next visit to Target. Ooh that is a great use for them! Thanks so much for the tip! Hope you’re having a great week, Audrey! 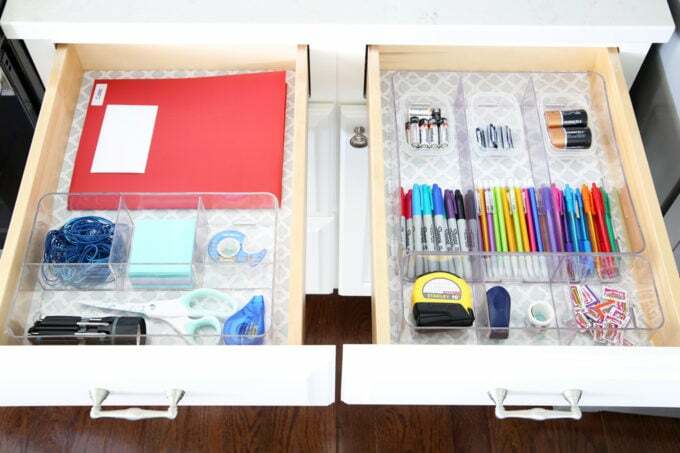 I like the acrylic drawer organizers! It always seems a shame to me to have pretty drawer lining paper and then hide it under a silverware tray. To keep the silverware tray from sliding around as the drawer is opened and closed, I’ve attached a Command velcro picture hanger to the bottom of the tray so it sticks to the drawer. It’s easy to remove when you want to clean the tray. Your aqua is so beautiful! Ooo, thanks for sharing, Stephanie! I totally love the S hooks! Looks like I might have to go on a shopping adventure soon! Great post, Abby… love all the choices! I need to get one of those Pillowfort bins! So ‘fresh’ looking! Kmart in Australia have food storage containers which look exactly like Tupperware modular mates (so will stack with them) and are also air tight and water tight (a friend tested them!). Best of all, they sell a varied size pack of 6 for $12! Ooo, thanks so much for sharing, Rachael! I definitely have to try hanging my necklaces. I don’t have a lot because I’m not a huge jewelry person, but the ones I have get tangled so easily. Yes, necklaces can be so tricky. This has worked wonders for me. Hope it does for you, too! 🙂 Have a great day! I’m going to have to try the towel bar for necklaces. I don’t own many but I certainly want the ones I have to stay pretty and untangled. Seems like a good time saver as untangling can be so frustrating. I’ll have to look for the oxo containers next time I go. The Target closest to me was in a huge remodel last month and I couldn’t find anything. Thanks for all the wonderful suggestions & looking forward to the summer posts! I love the towel bar and S hook hack…got to do that. Was just grousing this morning when I was reaching for one particular necklace and about 5 others fell. Obviously, I need to shop Target more…there’s one about 20 minutes down the interstate. I don’t remember how I found you but I love your ideas! 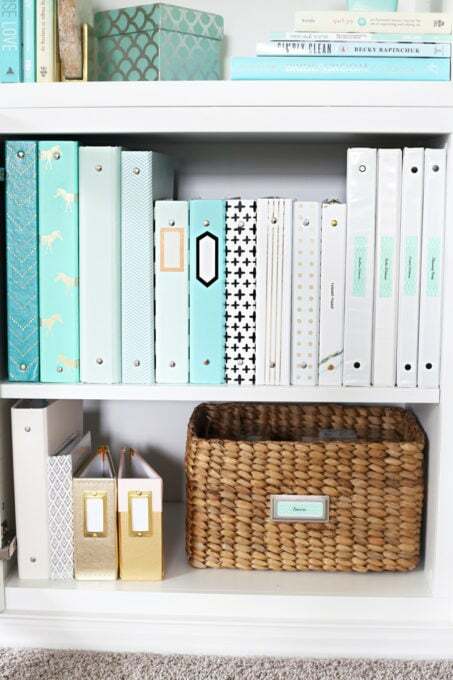 As a organizer at heart, I’d love to keep all the blog’s organized somehow for easy access for when I need inspiration! I’m sure Pinterest could help with that! 🙂 Thanks so much, Gretchen! Have a great evening! I discovered the spice inserts for drawers and they fit perfectly in the skinny long drawers on both sides of my stove. Love them. Off-topic, but I cannot stop staring at the wonderful pillow on your white chair. It’s behind you on my left side, your right. That teal flower with the tan stem on white background! It’s exactly what I’m looking for. Do you know where you got it? I love all of your organization ideas! 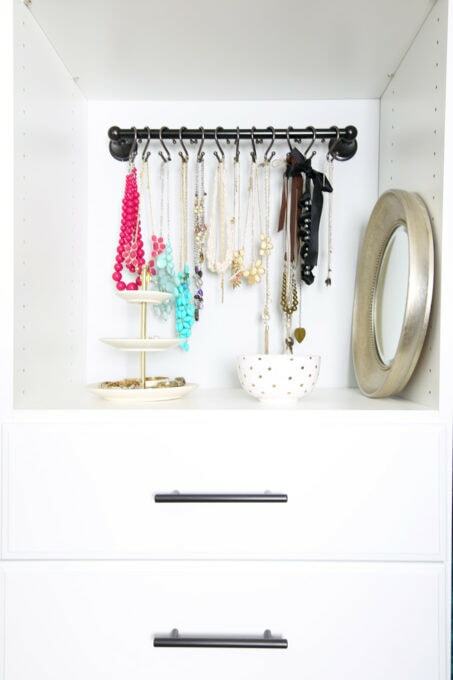 The necklace organizer is genius! I definitely need to get a bin like you have to hold wrapping paper – it looks so easy to grab what you need and stay organized. Thanks for sharing!